Two more volunteers are making their voices heard – literally. They have started singing as a duet at 2 p.m. on Mondays in the second floor dining hall. They will sing at least one-half hour each session. These two dedicated volunteers – Sybil Skaggs and Susie Milby – are also starting something else that is new: singing in residents’ rooms on a one-on-one basis. Many residents love the visitation and the demand on these ladies’ time is great. At our recent board meeting, we updated our active and inactive volunteer list and went over some of our planned activities for residents. We also discussed our need to replace some of our hymn books which are showing signs of wear and tear. We are going to obtain 11 new hymn books. In the back of the books we are going to dedicate each book to the memory of a recently deceased resident, Bobby Morris. The board thought this was appropriate since Bobby was a good Christian and well-liked by staff, volunteers and residents. 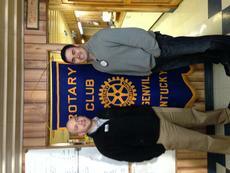 Elizabethtown Community and Technical College Agriculture Specialist Daniel Carpenter, left, was a guest at Thursday’s Hodgenville Rotary Club. 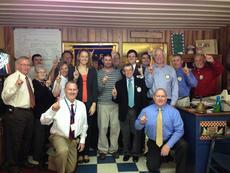 He spoke about his new role as agriculture specialist at the college and was the guest of Rotary President Kyle Williamson. 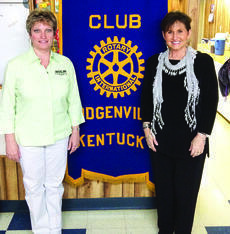 University of Kentucky wide receiver coach Tommy Mainord was the guest speaker at last week’s meeting of the Hodgenville Rotary Club. 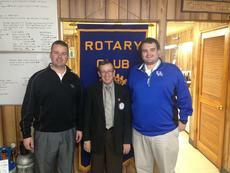 He is pictured with Rotarian Dale Morris and student coach Josh Estes-Waugh. 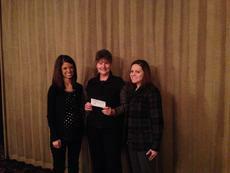 Members of the Elizabethtown Junior Woman's Club attended their third annual Charity Cocktail on Oct. 19. 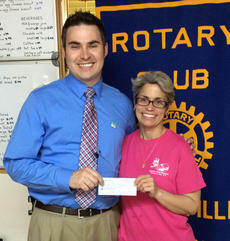 Proceeds benefited the American Cancer Society. 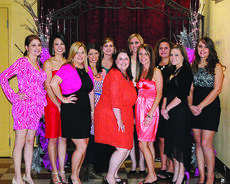 Front from left, Jacinta Perkins, Michelle Nevitt, Leanna Milby, Teresa McMahan; back, Leslie Steiner, Eileen Townsend, Andrea Pelley, Shelley Brackett, Loren Shawley, Desiree Perkins and Hilary Skaggs.